Alexandre Dumas, père, born Dumas Davy de la Pailleterie (July 24, 1802 – December 5, 1870), was a French writer, best known for the numerous historical novels of high adventure which have made him one of the most widely read French authors in the world. Many of his novels, including The Count of Monte Cristo, The Three Musketeers, and The Vicomte de Bragelonne (The Man in the Iron Mask) were serialized in popular journals, and remain popular with audiences of all ages today. Their enduring popularity is based on Dumas' treatment of universal human themes of unity, trust and betrayal, revenge and redemption. He also wrote plays, magazine articles, and was a prolific correspondent. Alexandre Dumas was born on July 24, 1802, in Villers-Cotterêts, Aisne, near Paris, France. He was the son of Thomas-Alexandre Dumas, a French General, and of Marie-Louise Elisabeth Labouret, the daughter of an innkeeper. His father was himself the son of the Marquis Alexandre-Antoine Davy de la Pailleterie, who served the government of France as Général commissaire in the Artillery in the colony of Saint-Domingue, and his black slave Marie-Césette Dumas. This made Alexandre Dumas a "quadroon." General Dumas died in 1806, when Alexandre was not yet four years old, leaving a nearly impoverished mother to raise him under difficult conditions. Although Marie-Louise was unable to provide her son with much in the way of education, it did not hinder young Alexandre's love of books, and he read everything he could get his hands on. Growing up, his mother's stories of his father's brave military deeds during the glory years of Napoleon I of France spawned Alexandre's vivid imagination for adventure and heroes. Although poor, the family still had the father's distinguished reputation and aristocratic connections, and after the restoration of the monarchy, twenty-year-old Alexandre Dumas moved to Paris, where he obtained employment at the Palais Royal in the office of the powerful Louis-Philippe of France, duc d'Orléans. While working in Paris, Dumas began to write articles for magazines, as well as plays for the theater. In 1829, his first solo play, Henry III and his Court, was produced, meeting with great public acclaim. The following year his second play, Christine, proved equally popular and as a result, he was financially able to work full time as a writer. However, in 1830, he participated in the revolution that ousted King Charles X and replaced him on the throne with Dumas' former employer, the duc d'Orléans, who would rule as Louis-Philippe, the "Citizen King." Until the mid 1830s, life in France remained unsettled with sporadic riots by disgruntled Republicans and impoverished urban workers seeking change. As life slowly returned to normal, the nation began to industrialize and, with an improving economy combined with the end of press censorship, the times turned out to be very rewarding for the skills of Alexandre Dumas. After writing more successful plays, he turned his efforts to novels. Although attracted to an extravagant lifestyle, and always spending more than he earned, Dumas proved to be a very astute business marketer. With high demand from newspapers for serial novels, in 1838, he simply rewrote one of his plays to create his first serial novel. Titled Le Capitaine Paul, it led to his forming a production studio that turned out hundreds of stories, all subject to his personal input and direction. From 1839 to 1841, Dumas, with the assistance of several friends, compiled Celebrated Crimes, an eight-volume collection of essays on famous criminals and crimes from European history, including essays on Beatrice Cenci, Martin Guerre, Cesare and Lucrezia Borgia and more recent incidents including the cases of executed alleged murderers Karl Ludwig Sand and Antoine François Desrues. Dumas also collaborated with his fencing master Augustin Grisier in his 1840 novel, The Fencing Master. The story is written to be Grisier's narrated account of how he came to be witness to events in the Decembrist Revolt in Russia. This novel was eventually banned in Russia by Czar Nicholas I of Russia, causing Dumas to be forbidden to visit Russia until the Czar's death. Grisier is also mentioned with great respect in both The Count of Monte Cristo and The Corsican Brothers as well as Dumas' memoirs. In 1840, he married an actress, Ida Ferrier, but continued with his numerous liaisons with other women, fathering at least three illegitimate children. One of those children, a son named after him, would follow in his footsteps, also becoming a successful novelist and playwright. Because of their same name and occupation, to distinguish them, the elder is referred to as Alexandre Dumas père, the son as Alexandre Dumas, fils. Dumas made extensive use of the aid of numerous ghostwriters, of which Auguste Maquet was the best known. It was Maquet who outlined the plot of The Count of Monte-Cristo and made substantial contributions to The Three Musketeers and its sequels, as well as several of Dumas' other novels. When working together, Maquet proposed plots and wrote drafts, while Dumas added the details, dialogue, and the final chapters. His writing earned him a great deal of money, but Dumas was frequently broke or in debt as a result of spending lavishly on women and high living. The large and costly Château de Monte-Cristo that he built was often filled with strangers and acquaintances who took advantage of his generosity. When King Louis-Philippe was ousted in a revolt, Dumas was not looked upon favorably by the newly elected President, Charles Louis Napoleon Bonaparte. In 1851, Dumas fled to Brussels, Belgium, to escape his creditors, and from there he traveled to Russia, where French was the language spoken by the aristocracy, and where his writings were enormously popular. Dumas spent two years in Russia before moving on to seek adventure and fodder for more stories. In March of 1861, the kingdom of Italy was proclaimed, with Victor Emmanuel II as its king. For the next three years, Alexandre Dumas would be involved in the fight for a united Italy, founding and leading a newspaper named Indipendente, returning to Paris in 1864. 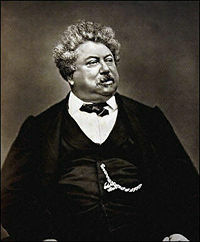 Despite Alexandre Dumas' success and aristocratic connections, his mixed-race lineage would affect him all his life. In 1843, he wrote a short novel, Georges, that addressed some of the issues of race and the effects of colonialism. Nevertheless, racist attitudes impacted his rightful position in France's history long after his death on December 5, 1870, at the age of 68. In June 2005, Dumas' recently-discovered last novel, The Knight of Sainte-Hermine, went on sale in France. Within the story, Dumas describes the Battle of Trafalgar in which the death of Lord Nelson is explained. The novel was being published serially and was almost complete by the time of his death. A final two-and-a-half chapters were written by modern-day Dumas scholar Claude Schopp. The Vicomte de Bragelonne (Le Vicomte de Bragelonne, ou Dix ans plus tard, 1847): When published in English it was usually split into three parts "The Vicomte de Bragelonne," "Louise de la Valliere," and "The Man in the Iron Mask," of which the last part is the most well-known. Though best known now as a novelist, Dumas earned his first fame as a dramatist. His Henri III et sa cour (1829) was the first of the great Romantic historical dramas produced on the Paris stage, preceding Victor Hugo’s more famous Hernani (1830). Produced at the Comédie-Française and starring the famous Mlle. Mars, Dumas’ play was an enormous success, launching his career. It had 50 performances over the next year, extraordinary at the time. Other hits followed. For example, Antony (1831), a drama with a contemporary Byronic hero, considered the first non-historical Romantic drama. It starred Mars's great rival, Marie Dorval. There were also La Tour de Nesle (1832), another historical melodrama; and Kean (1836), based on the life of the great, and recently deceased, English actor Edmund Kean, played in turn by the great French actor Frédérick Lemaître. Dumas wrote many more plays and dramatized several of his own novels. Buried in the place where he had been born, Alexandre Dumas remained in the cemetery at Villers-Cotterêts until November 30, 2002. Under orders of the French President, Jacques Chirac, his body was exhumed and in a televised ceremony, his new coffin, draped in a blue-velvet cloth and flanked by four Republican Guards costumed as the Musketeers—Athos, Porthos, Aramis, and D'Artagnan—was transported in a solemn procession to the Panthéon of Paris, the great mausoleum where French luminaries are interred. In his speech, President Chirac said: "With you, we were D'Artagnan, Monte Cristo, or Balsamo, riding along the roads of France, touring battlefields, visiting palaces and castles—with you, we dream." In an interview following the ceremony, President Chirac acknowledged the racism that had existed, saying that a wrong had now been righted with Alexandre Dumas enshrined alongside fellow authors Victor Hugo and Voltaire. Gorman, Herbert. The Incredible Marquis, Alexandre Dumas. New York: Farrar & Rinehart, 1929. Lucas-Dubreton, Jean. The Fourth Musketeer. Trans. by Maida Castelhun Darton. New York: Coward-McCann, 1928. Maurois, André. The Titans: A Three Generation Biography of the Dumas. New York: Harper & Brothers, 1957. Reed, F.W. A Bibliography of Alexandre Dumas père. Pinner HIll, Middlesex: J.A. Neuhuys, 1933. Works by Alexandre Dumas, père. Project Gutenberg. 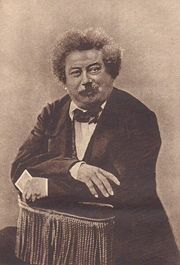 The Alexandre Dumas père Web Site, with a complete bibliography and notes about many of the works. Lost Dumas novel hits bookshelves. Dumas' Works: text, concordances and frequency lists. 1866 Caricature of Alexandre Dumas by André Gill. Freely downloadable works of Alexandre Dumas in PDF format (text mode). This page was last modified on 11 November 2016, at 16:15.